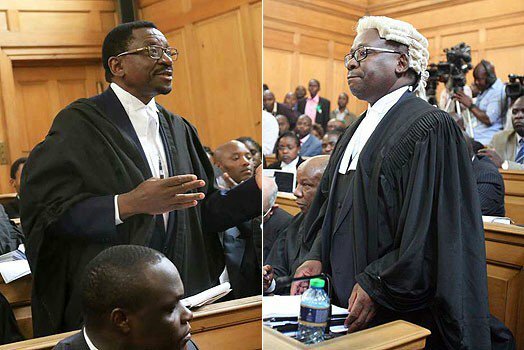 Top NASA lawyer and walking constitution orengo has schooled attorney general about the law and has made it clear that swearing in is real. Orengo has said that the swearing in ceremony of raila odinga will go as planned and that threats will not stop them from achieving their objective. He warned the attorney general to go back and read the law and stop being a jubilee propagandists. Here is what he said in a local TV show. "When he (the AG) is making pronouncements, he should make statements that have got the imprint of the law of the land and the Constitution. But when he makes statements that makes him look like a propagandist for the ruling party, then one begin to lose faith in that office" he warned the attorney general. "Go back to law school, what we will do is not outside the constitution but is provided in the constitution"
He warned muigai that the will of the people lies in the hands of the people and no threats and intimidation will stop them from swearing in Raila odinga.